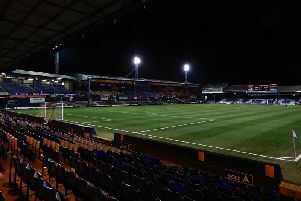 Dan Potts scored a dramatic stoppage time winner on his 100th appearance for the club as Luton picked up their first away of the season at Oxford United this evening. The full back, who had been denied what looked like a perfectly good goal just moments earlier, rose highest to nod in Alan Sheehan's free kick and send the away end into delirium. Victory was no more than the Hatters deserved against a dreadful U's side, as they created by far the better of the chances, but as has been their issue in recent times, just couldn't take them. Town boss Nathan Jones made one chance to his side, Harry Cornick in for Jorge Grant, as both sides had opportunities early on, Jon Obika failing to convert a close range header and James Collins just unable to get on the end of Jack Stacey's low cross. An open game saw Pelly-Ruddock Mpanzu fire a powerful effort that ex-Town loan keeper Johnny Mitchell palmed behind for a corner. From the set-piece, Potts met Andrew Shinnie's delivery, with Jamie Hanson's vital interception preventing his header from flying in. Lee then tested Mitchell, who comfortable gathered his bouncing volley from 20 yards, while Cornick really should have done better on 20 minute when Shinnie's cross was cleared to him, scuffing wide from close range. James Shea was called into action on 21 minutes, diving full length to parry Gavin Whyte's 22-yarder away as the U's man was worryingly allowed to run and run. Hatters then had a spell of pressure, Mpanzu's attempt charged down, while Glen Rea's 25-yarder lacked the power to beat Mitchell. Town had the chance of the match on the half hour, as Lee picked out the run of Mpanzu perfectly inside the box, the midfielder taking a touch, steadying himself and then proceeded to blast over. Shinnie was wayward once more, while Lee almost broke the deadlock, his effort deflecting over the bar. After the break, Hatters somehow fell behind just three minutes in, as Ricky Holmes burst forward from midfield and allowed to size up the bottom corner, did just that, pinging his effort beyond Shea. Luton almost had a equaliser straight away, Cornick's shot shovelled behind by Mitchell. The visitors weren't behind for long though, seven minutes in fact, as Mpanzu broke free on the left and his low cross saw Cornick somehow hit the bar from three yards, but Collins was there to sidefoot home. Hatters should have been ahead on 70 minutes, Stacey putting the ball on a plate for Mpanzu, who dead centre of the goal, blasted into carpark. The U's were down to 10 men on 73 minutes though when Shandon Baptiste, who had been walking a disciplinary tightrope after a first half booking and might have gone at least twice, eventually did for a foul on James Justin. Kazenga LuaLua came on for the final 10 minutes and it was he who won the free kick that fellow sub Sheehan delivered perfectly into the area for Potts to nod home a wonderful winner. United: Jonathan Mitchell, Luke Garbutt, Rob Dickie, Curtis Nelson, Jamie Hanson (Josh Ruffels 77), Cameron Brannagan, Ricky Holmes, Gavin Whyte (Jamie Mackie 76), Jon Obika (Samir Carruthers 82), Shandon Baptiste, Tony McMahon. Subs not used: Scott Shearer, Sam Smith, John Mousinho, James Henry. Hatters: James Shea, Jack Stacey, Matty Pearson, Sonny Bradley, Dan Potts, Glen Rea (C Alan Sheehan 87), Pelly-Ruddock Mpanzu, Andrew Shinnie (James Justin 70), Harry Cornick, Elliot Lee (Kazenga LuaLua 78), James Collins. Subs not used: Harry Isted, Alan Sheehan, Aaron Jarvis, Alan McCormack, Jorge Grant. Booked: Baptiste 28, Stacey 66, Hanson 76, Rea 81, McMahon 90, Brannagan 90.